Sorry for the absence lately...life got in the way, and as I've mentioned before, that's first for me. I apologize for missing the last few weeks of football game previews (first ones I've missed in 4 years of doing this site). What better time to rev things back up again...because it's Wooster Week and several fall sports teams are still alive in tournament play, so let's get it started. No sugar coating things...2012 has been a tough year for the football team, but it shouldn't reflect poorly on the kids or the coaches as they continue to work hard and do all they know how to do...work hard and prepare to the best of their ability. I've seen flashes of good things the last 3 weeks and I'm hoping that it culminates in 8 weeks of bad luck and bad breaks turning around against Wooster and we can get that 8th straight win against our rival. It was tough watching the seniors take one last walk up and down the turf at Heartland Field after suffering their 5th home loss....tough seeing the kids get emotional knowing their playing days on their home field were done. Wins aren't deserved, they're earned...but this team and group of seniors especially deserve a win in their final game as Red Riders. No playoffs this year, so this is our state championship. I hope to see an inspired bunch of Red Riders this Saturday at Follis Field. The bonfire is Friday night and will kick off with a parade at 7pm at the north end of the stadium (by Mineral Spring Street). The Wooster dummy will be retrieved and brought back to the stadium where Coach Davault and the seniors will speak before the bonfire. After the bonfire, adults are invited to Senor Panchos for the Adult Rally starting at 9pm. Always a good time full of Red Rider Spirit. This event is sponsored by the Booster Club. The 102nd version of the Orrville-Wooster game will be Saturday night at 7pm. Hope to see a good turnout for the last game of the year. We're used to the Wooster game sort of kicking off the "second season," but it wasn't to be this year....so week 10 is it. Come out and support these young men who have put many hours and sacrificed to be part of this team. If you can't make it, the game will be broadcast on AM960 and also webcast at www.wqkt.com. 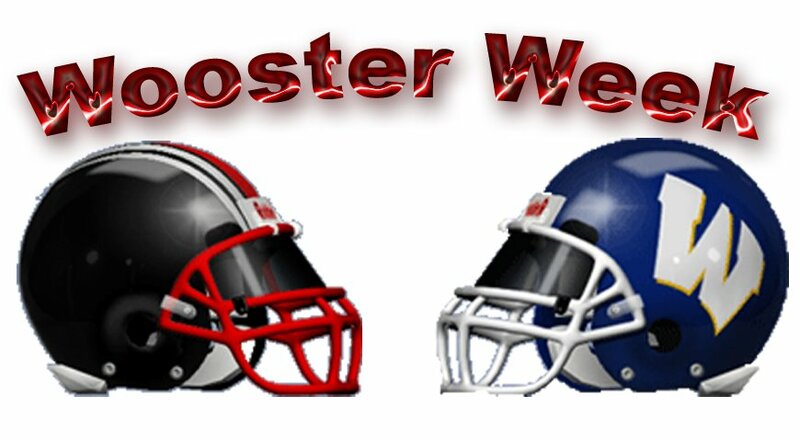 Here's some past writing I did on some of the great Wooster Week games. Always nice to go back and read those. No matter if we're 9-0 or 1-8...it's still a BIG deal to beat Wooster. According to this page on Wikipedia, Orrville/Wooster is the 6th longest running rivalry in Ohio. Massillon/McKinley is the oldest, with the first game being played in 1894, then Sandusky/Fremont Ross (1895), Dover/New Philly (1896), Piqua/Troy (1899), Ironton/Portsmouth (1902) and then Orrville/Wooster. The full game-by-game breakdown of the Orrville/Wooster series is compiled here. Obviously the first season on turf didn't go so great for the football team, but the sheer use of the facility was very impressive as the 7th, 8th, freshman & JV football teams played on it, the JV & Varsity soccer teams & also the OABGC tackle football teams were able to play on it as well. There was even a Saturday where a JV football game was played on the turf in the morning and then a soccer match in the afternoon. This simply would not have been able to be done on grass....and I'm hearing rumblings about Wooster getting turf for 2013 and that Clear Fork is also exploring forming a fundraising committee. If Wooster does get turf, then this years Orrville/Wooster game could be the last game played on grass for the foreseeable future. One finishing touch to the stadium was the installation of the donor board recognizing the many who gave to the turf project. I think the final number ended up being in the neighborhood of $685,000. Thank you again to all those that helped make it happen. Playoff Game at Heartland Field? The school has filed paperwork with the OHSAA to be considered for hosting a playoff game or games this post-season. It would most likely be a Division 4, 5 or 6 game as our facility isn't big enough to host some of the upper division games that would draw big crowds. One appealing potential matchup would be between Norwayne and Northwestern. It's possible that those 2 could meet in the 2nd round of the Division 4 playoffs, and what better venue to host than ours? Good luck to the Red Rider volleyball team as they seek their 2nd district title in 3 years as they take on WCAL champ Dalton at 7pm at Smithville. The winner will advance to the Barberton regional to take on Canfield South Range next Thursday at 6pm. The regional bracket is here. Good luck to the girls cross country team as they compete in the Boardman Regional this Saturday. The girls placed 5 runners in the top 35 at the Malone District and finished 4th as a team to advance to regionals. Haley Woodruff paced the Rider runners with a 4th place overall finish. Good luck ladies!! The drawing for the Chevy Cruze donated by Serpentini Chevrolet will be held on December 28th at halftime of the boys basketball game. 2nd prize is a TV from Bennett's and 3rd prize is a recliner from Brown's Furniture. Tickets are $10 each or 3 for $20. Would make great stocking stuffers if you're starting to think about Christmas.